The Planet X complex is most often lost in the glare of the Sun, but can best be glimpsed at sunrise or sunset when the glare of the Sun is reduced. At these times, the red light spectrum light from both the Sun and Planet X, which bends around the curvature of the Earth, is predominant. Mid-day glimpses are rare, due to the flood of light from all spectrums creating glare. 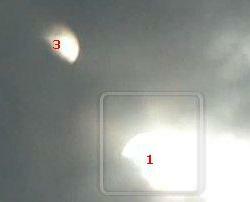 But when the Sun is behind cloud cover the light from Planet X, the Second Sun, can at times be seen. On December 18, 2009 a dramatic video was taken at a time when dense clouds were drifting across the sky. The video was reportedly taken in mid-morning at 10:23 GMT, indicating the video might have been taken in Europe, with English not the native language. I was fliming the sky, then after when i looked back i saw to suns in the sky. ????? Nibiru??? I Filmed this on Dec 18th 10:23am GMT Any ideas? The Zetas confirmed that this was a valid capture of the Second Sun. ZetaTalk Comment 1/2/2010: Yes. There are clearly two light sources, both in the shape of an orb. In fact, there are more than two orbs,  being the Sun, and  being Planet X which would be to the right of the Sun and along the Ecliptic when viewed from the northern hemisphere. However,  and  are likely light funneling down along a Moon Swirl, in a similar manner to the video capture of a Moon swirl orb in Padua, Italy on August 24, 2009. This was detailed in Issue 148 of this newsletter. Moon Swirl light can be more brilliant and focused than the light from Planet X itself, which is shrouded by dust. These orbs are clearly not lens flares, as they are often behind the clouds. 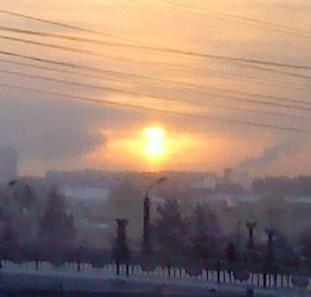 A light source above the Sun was captured in Moscow recently, too, on January 5, 2010. A discussion on the GodlikeProduction message board highlighted that Sheriffs, Police Chiefs, and Congressmen are resigning in droves lately. Some 26 examples of Police Chiefs or Sheriffs resigning were listed, occuring between April-September 2009. No compelling reason for resignation is given for most of the 26 examples, some after decades of service. In almost all cases, another job or post was not awaiting the retiree either. Given the global economic depression, with a shortage of good jobs, leaving a post that pays on average $93,980 is odd. A sample of these resignations are quoted below. Police Chief Randy Adams, citing the need for an extended break from nearly 37 years of public service, said he will retire in July. Adams said he decided to retire months later after determining that his command staff was at a point where it could continue without him. And given the impending belt-tightening planned for later this spring, it made sense to step out. If Assistant Police Chief Ron DePompa were to take over as interim chief, leaving a top position open in the department, it would free up about $180,000 in salary money. Phoenix Police Chief Jack Harris is stepping down from his position as a board member of the Arizona Peace Officer Standards and Training Board after a five-year run. No reason was given for the departure in an announcement by police this afternoon. The town of Gate City is taking applications for a new head law enforcement officer after Police Chief Jason Cox submitted his resignation. Cox has been in the position almost six years. Cox didn't give a reason for his decision to step down, only saying that he was resigning. The department had about 14 people in 1983. A quarter of a century later, Hayes will leave the force July 31, having spent most of that time as chief. Hayes, 58, announced his retirement to his staff this week. He'll be looking for a new job, something "totally unrelated." After 26 years on the force, Anchorage Police Chief Rob Heun is retiring. Heun made the announcement Monday, and said he's leaving on his own terms. LeGrand "Chip" Guerry gave up his position as top cop in Clover, retiring after nearly 10 years with the department. He'll start a new career Thursday as criminal justice instructor at York Technical College. Mount Airy Police Chief Roger McCreary has announced he will retire effective Oct. 1, bringing a 28-year law enforcement career to a close. Per the Zetas, the reason for the mass exodus is related to recent Homeland Security directives. ZetaTalk Explanation 1/9/2010: Everyone has their eyes on those in top government positions or in Congress or in NASA or the very wealthy or those running large corporations. Are they retiring or disappearing from public view, suddenly, in great numbers, and is this a clue that the pole shift is imminent? Thus, a recent exodus of police chiefs almost escaped notice. Is this merely coincidental, or is there a reason for the exodus? Those in law enforcement at the local level consider the community their home, and those they must muscle in any confrontation neighbors. Thus, when new rules come down from the state and especially the federal level on what to do during rioting or mass migration, the expectation that local police will have to turn their guns on their friends and neighbors runs against the grain. Emergency management meetings and notices are not public fare, and thus the public is not aware of the chatter. The economy falters. Individuals stressed by job loss and home foreclosure are exploding into rage and turning this on themselves and others with increasing frequency. But it is the anticipation that major flooding or earthquakes will produce massive numbers wanting to migrate within the country that is the prevailing concern of late. In these cases, migration is to be blocked and controlled. Guns turned on families with babes in arms is not something these police chiefs signed up for, and they are declining the new rules by retiring, their only option. It is not just police chiefs and Sheriffs who are leaving in droves. Congressmen also, both Republican and Democratic, are stating they will not run for re-election. In the House, 14 Republicans and 10 Democrats are retiring, and Robert Wexler, a Florida Democrat, has resigned, leaving one vacancy. In the Senate, six Republicans, including several in swing states requiring expensive campaigns, and four Democrats, including Dodd and Dorgan, aren't running. Per the Zetas, this is related to their personal knowledge of what is coming, the pending cataclysms, either by direct knowledge or by rumor. ZetaTalk Explanation 1/9/2010: Many in Congress have been informed either directly or indirectly via rumor and innuendo that the cataclysms will not be mild, and those they govern will be desperate for answers and help. They don't want to be in the position of refusing answers, uncomfortable in a lie, and especially don't want to have to share their survival preparations with demanding taxpayers. Retiring puts them out of the heavy traffic lane. In the recent past, 2007, it was noted that NASA employees were retiring early, apparently for similar reasons. Question: Two NASA employee's, two of the top officials, say they are going to resign before the end of the year, 2007. What is the real reason behind this development, are they going to their bunkers? ZetaTalk Explanation 7/14/2007: We have mentioned the stress within NASA, as to be an employee there is to be aware of secrets that are terrible. Employees are not allowed to talk to family, not allowed to unburden except to each other, and not allowed to make any changes in their lives that would give a clue to the public about what is coming. They have one choice, if they wish to move from Houston or another facility in an unsafe zone. They must retire! For most, who are not of retirement age, they cannot afford this, or their commitments to others require them to keep their job intact and remain in their location. Frankly, most think they will have time to escape, as the 270° roll of Planet X is going slowly. But this exodus is a clue, and an increased exodus would be a big clue, though you are unlikely to hear about mass resignations announced by the major media for this very reason. Extremes, from severe cold to snowfall depths, were experienced across the northern hemisphere. From Europe to N America to Asia to Siberia, the reports were the same - records broken, and travel paralyzed. A cold snap across Europe killed 13 people in Poland over the New Year as avalanches and skiiing accidents left at least 10 others dead in the Alps, As temperatures plunged to minus 25 degrees Celsius (minus 13 Fahrenheit) in Poland. Western Europe is shivering through one of its coldest winters in decades with heavy snowfalls causing serious disruption to road, rail and air traffic over the Christmas and New Year holiday periods. In Britain, some 60 revellers were stranded for three days at the Tan Hill Inn, England's highest pub, standing 1,700 feet (518 metres) above sea level, in the northern Yorkshire Dales after snowstorms on New Year's Eve. A snowplough on Sunday finally broke through the more than two-metre (seven-foot) snow drifts, ending the revelry, dubbed Britain's longest-running New Year's Eve party. Nearly the entire eastern half of the United States is enduring bitterly cold temperatures not experienced since 1985. This winter has already been rough for many areas of the country, with several blizzards dumping high accumulations of snow upon the Plains, mid-Atlantic and New England. Over the past 20-plus years, when below-normal cold periods have arrived in the winter they tend to have been limited to one region. Seoul residents slogged through the heaviest snowfall in modern Korean history after a winter storm dumped more than 11 inches (28 centimeters), forcing airports to cancel flights and paralyzing traffic in South Korea's bustling capital. The snowfall was the heaviest in a single day since Korea began conducting meteorological surveys in 1937. A freezing cold front swept over much of northern China with snowstorms snarling traffic and air travel, while some of the coldest temperatures in decades were forecast for coming days. Gale-force winds sweeping down from Siberia could result in temperatures as low as minus 16 degrees in the capital. Such temperatures are believed to be the coldest in the capital in 40 years. When asked about this, whether such trends will continue or abate, the Zeta answers have consistently been the same - we told you to expect this, we told you so. So why are you surprised? ZetaTalk Response 1/9/2010: We are periodically asked about the weather, though we have repeatedly stated that our predictions in 1995, when ZetaTalk first began, will hold. We predicted increasing drought and deluge, switching about, becoming more intractable and this occurred. We predicted temperature swings, and this occurred. We predicted that the seasons would begin to blend into each other, though this has not yet occurred to meet our prediction, though it will. We predicted snow in summer and this has occurred. We predicted crop shortages caused by all these weather extremes and this is no longer denied by the authorities. We predicted in January of 2009 that the northern hemisphere would have colder then normal weather because of the push away the N Pole experiences during the Earth wobble, and this has occurred. We also recently stated that a prediction for colder then normal weather did not mean a steady state, as swings are to be expected, in line with our earlier prediction that the seasons would blend. Thus, you should expect more cold and storms, but also unexpectedly warm weather!